The Grandmix 87 was the first mix where 2 TC electronics sampler delays were used. 1 Megahertz sampling rate (By comparison, a CD player has 44.1 KHz sampling rate). state of the art sampling and playback. half a rotation , and started...... 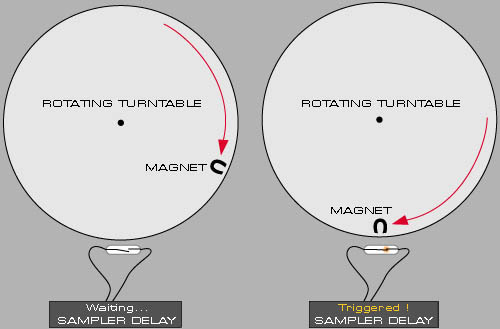 When the magnet passes the reed-relais, the next section was triggered. care of by "automated" triggering. edited tape, to the Akai DD1000 Optical Disc Recorder. The original tape was eq-corrected using the test-tones recorded on the tape in 1987. Recording these test-tones at the beginning of a master tape were standard procedures with analog recordings. azimuth (tape head angle) settings, and a 100Hz tone to check the low-end, all recorded at -10 or -20 dB. The tape was played back using the Studer A80 analog tape recorder at a speed of + 1% (just as in 87). the entire mix to compensate for the lower speed.